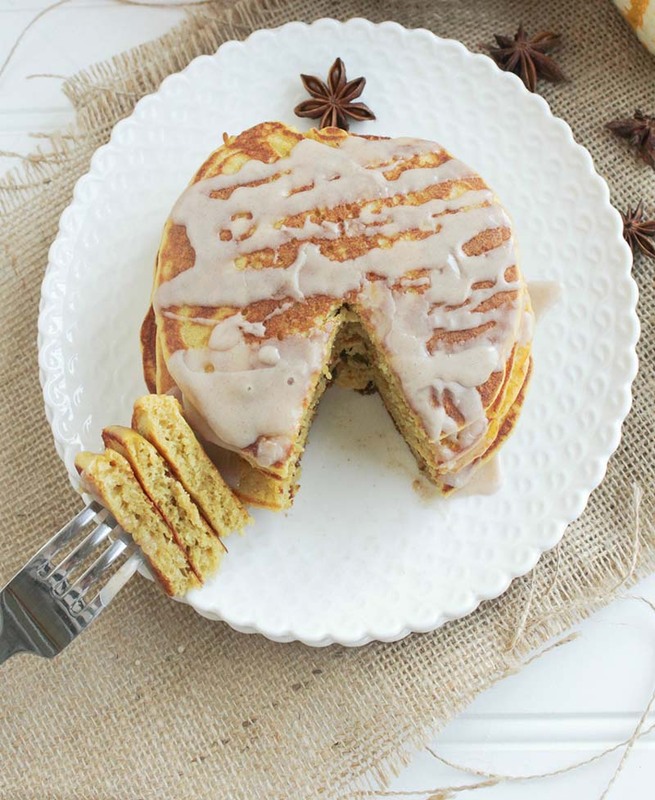 These pancakes are light, fluffy and have the perfect taste of autumn. They are the perfect way to start any fall morning. In mixing bowl, whisk together warm milk and yeast. Let set for 5 minutes. Whisk in eggs, pumpkin, oil and brown sugar. Mix in flour, salt and pumpkin pie spice. Once just incorporated, cover and let stand for 30 minutes. Heat griddle or non-stick pan to medium-high heat. Spray will cooking spray or bit of canola oil. Drop about ¼ cup batter on to hot pan and let cook until small bubbles form on surface. Flip and let cook for another 1-2 minutes, or until lightly golden brown. Whisk together glaze ingredients, adding more/less milk to achieve desired consistency. Drizzle glaze over warm pancakes and serve immediately.